A day after Bill de Blasio's Tale of Two Cities address in which the wealthy Park Slope resident once again made inequality his focus, the radical pol intervened to spring one of his biggest supporters from prison. 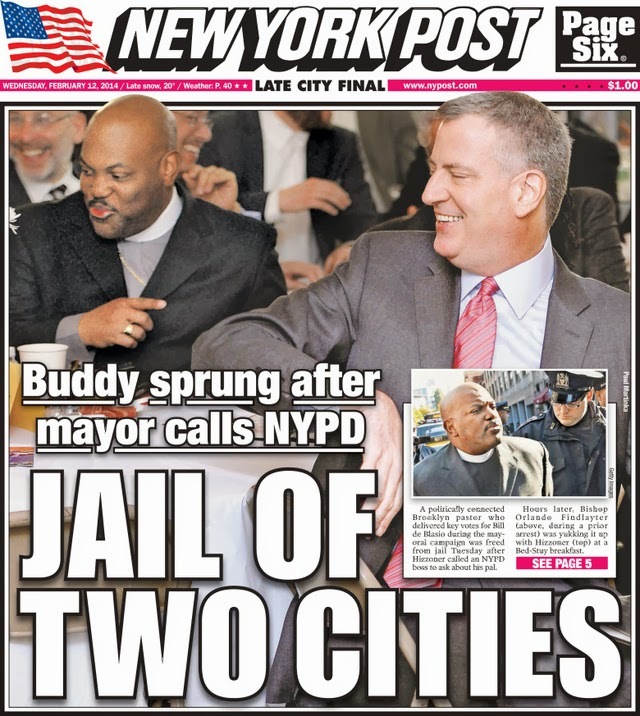 The New York Post, a tabloid that unlike the Daily News is much less enamored with the lefty dreamboat of the moment, responded with a cover page reading, "A Jail of Two Cities." Aside from being the commonplace corruption that one ought to expect from a politician trying to ban horses in Central Park because a wealthy real estate magnate wants to seize their stables, the Jail of Two Cities also reveals the fallacy of government wars against inequality. When government is big, then true inequality is not of wealth, but of political access. Money can buy you access, or as the recently released Orlando Findlayter discovered, so can being an activist who bets on the right horse-hating politician. The rich can write a check, but the poor can vote early and often. Access isn't about money; it's about becoming useful to those in power. There are two cities and two countries in America; the land of the politically connected who are part of a network that can score anything from millions in cash to open door prisons and the land of the politically unconnected who don't understand why the government won't leave them alone. It won't leave them alone because in a corrupt system, being left alone is a special political favor. Government should not be concerned with the inequality of income, which isn't in its purview, but with the inequality of access, which is. It's not the job of government to even out how much money everyone makes, but it is its job to ensure that everyone has equal access to government. In a city or a country run by income inequality campaigners like Barack Obama or Bill de Blasio, the inequality of wealth takes a back seat to the inequality of access. Pledges of income equality put the equalizers in charge of moving huge amounts of money around and determining who gets to wet his beak and who doesn't. Battling income inequality leads directly to inequality of access by putting the equalizers in charge of picking winners and losers through the agency of an expanding government that promises to fill in the gaps in income while instead creating gaps in access. The equalizers promise to fix the unfairness of the marketplace and replace it with the ideologically determined unfairness of government. The bigger government gets, the less sense it makes to invest in business and the more sense it makes to invest in politicians. Powerful politicians are a much less riskier investment than millions of customers whose behavior is hard to predict. The unpredictability of the public makes competition possible and reduces income inequality while the predictability of politicians is a monopoly that increases income inequality as political monopolies become economic monopolies. Obama handed out hundreds of millions to the Green Energy tycoons who supported him and dispenses ambassadorships to unqualified bundlers who barely know the name of the major country they have been assigned to. Voters who came out in collective groups for Obama got wealth redistribution paydays. Everyone else got taxed. There is no equality of access even within the ranks of his supporters. 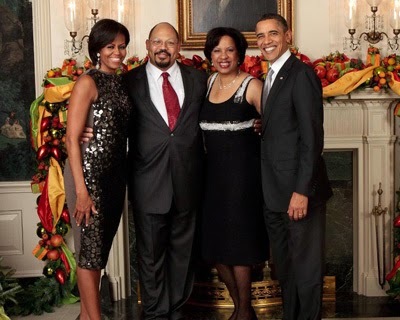 The Obama voter was rewarded with ObamaCare, but the ObamaCare website was outsourced to an incompetent company whose top executive was a pal of Michelle Obama. The company got a six hundred million dollar contract and the ObamaPhone voters got a broken website and hours on hold with operators and navigators. Government works when it's held accountable. Inequality campaigners avoid accountability by assembling a base of enthusiastic voters who come out in large percentages to score special access. Those voters are hard to beat because, like the politicians they vote for, they take bribes, using their votes to gain insider access in a corrupt system while ruining it for everyone else. They take the bribes and then complain that nothing works. And they're the reason why. Their corrupt choices are why the sidewalks are cracked, the streetlights don't turn on at night, the firefighters don't show up and the pension fund is empty. They have become complicit in a corrupt system that encourages them to take advantage of others even as it takes advantage of them. The voters who most depend on government vote to break it far more thoroughly than any Tea Party politicians could. No Republicans could have done to Detroit what Detroit did to Detroit. Not even the most extreme Tea Party politician could have done as much damage to the Federal government as Obama did. Corruption and ineptitude are far more of a threat to the progressive vision than any number of people waving Gadsden flags. Republicans can shut down or slow a progressive program, but only progressives can discredit it from the inside the way that Obama has managed to do with ObamaCare by taking it apart piece by piece to cover for his incompetence and appease pieces of his coalition.. The urban and rural political centers of the Democratic Party are places where the progressive vision lies dead and buried with a stake through its rotten heart while its zombie policy corpse shambles around decaying streets moaning, "Money, money, money." It doesn't take the Koch Brothers to kill the left. Letting the left have what it wants does it much more devastatingly, but with more collateral damage. Campaigns against income inequality invariably become mandates for corruption as aggrieved voters convinced that the system is rigged against them embrace the unfair advantage that they believe they are owed and politicians who pocket nine tenths of the take and leave the crumbs for their supporters escape accountability from their own corrupt voters because every crime they commit is officially for the benefit of the underclass. Class warfare leads to a culture of thievery even inside the most Socialist systems. The Soviet Union's class warfare produced Homo Sovieticus, a disgusting and pathetic creature who believed that "Everything belongs to the collective, everything belongs to me" and accordingly stole everything that he could get his hands on leading to a broken system where nothing was available in stores and everything was available on the black market. Even after the fall of the USSR, $400 billion in bribes are paid out annually. It's easy to sneer at the Russians, but their system has only more formally codified an arrangement that in the United States is more informal and assigned to political campaigns. 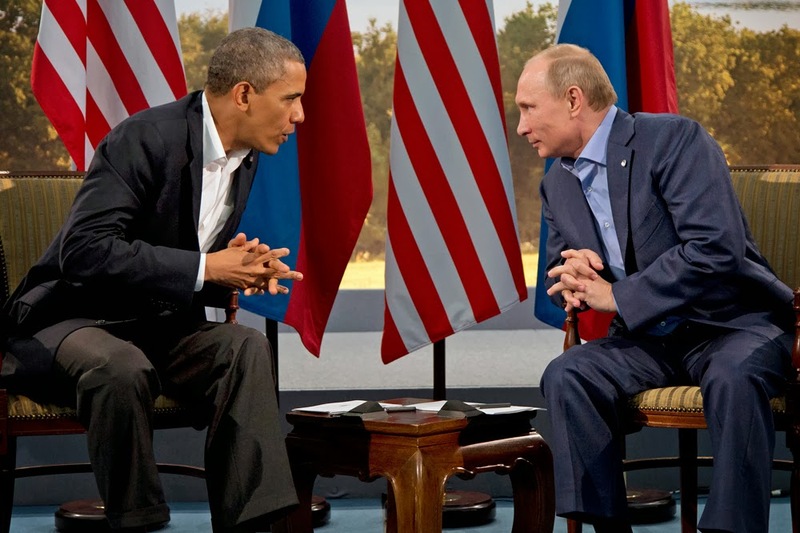 Russians bribe their officials for access. Americans bundle donations to them. The more power a government has over its people, the more people are willing to pay for access to those who hold power over them. The cycle of corruption follows its own inevitable momentum. The more people come to believe that a system is corrupt, the fewer will vote for honest politicians over the crooks who promise them special benefits. Everyone becomes cynical and complicit in the corruption. Politicians play divide and conquer, redistributing wealth from some groups to other groups. Trust vanishes from government and financial institutions. Everyone suspects everyone else... and everyone steals. That is the formula for a failed nation, a failed city and a failed community. That is as true of the United States as it is of Russia, Cuba or Nigeria. A society is built on confidence in its institutions and its people. When that confidence falls apart, savagery takes its place. And then every man's hand is raised against his neighbor, children are taught to steal, men make excessive outward displays of honor and generosity while having no more conscience than a snake, women fear husbands, daughters fear their brothers, rulers fear everyone and everyone fears the rulers, informers proliferate, the secret police are everywhere, nothing works and everyone has someone to blame. That is what a failed society looks like and it is where we are bound. Social justice politicians begin by telling a tale of two cities and end by locking up everyone in a jail of two cities to which they hold the key. "Letting the left have what it wants does it much more devastatingly, but with more collateral damage." Back during the 2012 primaries I suggested getting out of the Left's way, and you summarily dismissed this concept as "giving up". I stand by this strategy as we have seen the damage caused by the GOP allowing themselves to continue being the scapegoat. After decades of Liberal indoctrination in K-Graduate School, coupled with constant Liberal advocacy of the media, temporary pain will be the only way to teach people the dangers of Progressive/Liberalism. Short version... We've become a nation of rent seekers. I love that term. Learned it recently from a lawyer. But, your long version was definitely worth the read. The ways of tyrants always begin innocently, pie in the sky promises and a chicken in every pot, it is only fair. First the nudge you in a certain direction. Then they shove you in their direction (present stage). Next, they shoot. Remember: nudge, shove, shoot! Getting out of the way is giving up. The Communists in the USSR destroyed themselves. It only took generations and millions dead. Another great article. Each of us has a natural right--from God--to defend his person, his liberty, and his property. These are the three basic requirements of life, and the preservation of any one of them is completely dependent upon the preservation of the other two. For what are our faculities but the extension of our individuality? And what is property but an extension of our faculities? The Left's waste and corruption in places like Detroit, Chicago, the rest of Illinois, other places all over America, is clear. But the Republicans don't make progress by pointing it out because they don't oppose the Left intellectually, philosophically, and especially, morally. What the Left is doing when they cry 'poverty', 'inequality' (of result), etc. and then grab someone's hard earned money to fund stamping out these 'evils' is, in itself, evil. To help someone less fortunate than yourself may have merit but does so only if you earn the money first and then choose to voluntarily donate the money you earned . The 'charity at gun point' approach of the Left is out and out evil. But do Republicans challenge the Democrats and the Left on this issue? No. They stage hissy fits about how inefficient Obamacare, the War on Poverty, etc. are, and about web sites not working, etc. but they don't object morally. In effect, the Republicans say 'You should elect us because we won't be so wasteful and inefficient when we take over and manage the grand government slush fund/give away.' But they don't object morally to the slush fund/give away itself. With a pathetically weak argument like that, it's no surprise that the Republicans lose. The R's are perfectly happy with the IRS harassing those who want to change course from the mainstream. When the corruption works to their advantage they are eager to embrace it, at least, with their usual silence. The msm will support that silence, even compliment it a little. It seems there is little difference between the white hats and the black hats.except a bit of lip service. I wish I could give you a taller soap box. We are not the USSR, and there is a difference between tough love and giving up. As long as the GOP defends the Constitution, we can reversre the damage through the power of the vote. It is even worse than you could imagine. The Country is sliding down the razor blade of its existence. Deficits without end creating debt for generations to come to pay down but more likely refinance, with currents deficits to be added thereto. You fail to mention the huge Congressional-Military-Industrial complex, financially supporting each other -- the military for promotions and post retirement jobs in industry and think tanks and lobbying firms, the Industrial complex for building incomplete weapons system of dubious use in the 21st Century and then being paid bigger bucks to fix them, and the Congress whose single eye is on reelection to be funded by industry and special interests while vote are bought with bread and circuses. And what of the mandarin class -- the huge rotating drum of unelecteds moving through executive departments and staffs and lobbying firms with the speed of diarrhea, every onward, ever upward, It was they who lied to the CBO to get the a favorable opinion on ACA with phantom provisions somewhere in the 2300 unread pages, about which the CBO had to publicly apologize -- but only after Congressional approval and Presidential signature. Meanwhile in the State Capitols and on the Democrat large city plantations, the masters hold their willing servants in thrall for more bites from the pie made with OPM --pronounce it, it is Other People's Money. A shout out at all to those economists who bastardized their demigod -- J.M. Keynes -- as justifying government deficits at all phases of the business cycle. The hell he did. Say what you will about Richard Daley, at least he didn't have this smug, hectoring schoolmarm thing going on. He was corrupt, yes, but knew enough not to lecture people on morality, or to kill the goose that lays the golden egg -- and that's why Chicago hasn't turn out like Detroit. De Blasio on the other hand seems to have a blithe indifference towards the people who actually pay for his precious government programs.